View all of the pictures I selected for my 2013 photo calendar. My 2013 12-month photo calendar is now available for sale on my Zazzle online store. Thank you for your support! I’m warning you right now. The photo I picked for the month of August in my 2013 photo calendar has to be one of my very favorite and I’ll tell you the reason why below. I took it one morning this past August while strolling along at Balboa Park in San Diego. A popular area of the park features a couple of small ponds, which are sparsely covered with white and pink water lilies and populated with a few species of fish, including koi. My kids were in camp at the Natural History Museum that week and I had a few hours to kill before picking them up that day, so I grabbed my camera bag and walked around the park. There was a nasty heatwave that week, which included a lot of humidity, and my stroll quickly became tedious. There’s nothing worse than sitting still in full blasting heat and sun trying to take a hundred photos of the same thing. I started shooting pictures from different angles, different water lilies (or lily pads if you prefer). Every time I looked at the preview on my camera’s back screen, I wasn’t very excited about what I saw. It seemed the light was too bright and something just wasn’t right. So after a few minutes of frustration, I packed my bags and left, looking for something else to photograph, this time in the shade. I forgot about these photos for a few weeks, until I pulled the SD card out of my camera to look at some photos I’d taken afterwards. As I was browsing through the files, I noticed the water lilies, so I opened the images. And in the middle of a few good shots, I found this photo of lily pads below. I call it my miracle photo. Why? Because the photo you’re looking at had no work done on it. I didn’t have to recenter it and adjust any of the settings. It literally came out that way. By the way, this never happens (OK, only in the movies!). 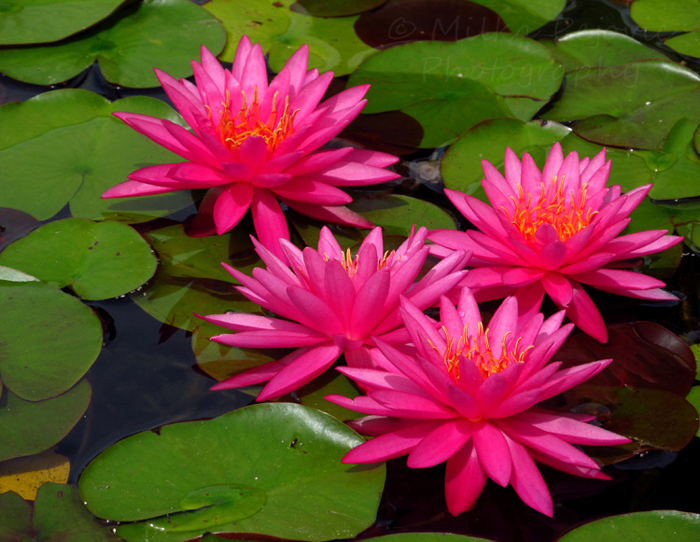 So there you have it, the beautiful pink water lilies of San Diego’s Balboa Park is my August 2013 photo pick. Don’t forget you can click on the photo to see a larger view. Enjoy! Posted by Milka Pejovic on October 4, 2012 in Bloom Photos, California Photos, Flower Photos, Photos of San Diego and tagged 2013 calendar, 2013 photo calendar, blooms, California pictures, lily pad photos, photography, photos, photos of blooms, photos of flowers, photos of lily pads, photos of San Diego Balboa Park, photos of water lilies, photos of water lily, San Diego Balboa Park, water lilies photos, water lily photos. You already know I love this one! Glad to hear it again! I love how simple nature is, using green and pink, and looks so good. Thank you! I was shocked when I opened the image file. They didn’t seem to look that good when I took the photo, but I think the oppressing humidity and heat clouded my judgement. That is so pretty…and for my birthday month! Good pick–and good luck taking such a perfect picture with no enhancements. Awesome. this is so striking, isn’t it interesting that something comes alive in a picture that you wouldn’t expect!